Shaheed Yadgar Commttiee continuously doing its efforts in direction of spreading the thoughts of those real martyrs who sacrifice their lives without a bit of hesitation for freedom of India. In this direction a new step was taken by committee to organize the Quiz on these Martyr's unforgettable life stories. This began with organizing Quiz contest on Great Martyr Shaheed-E-Azam, Bhagat Singh on his 106th Birth Anniversary on dated Sept.28, 2013 at Govt. college, Bahadurgarh, Haryana. The invitation for this event was sent about a week ago to concerned schools and colleges. Vivek Vidya Sadan, Sr. Sec. School, Bahadurgarh. Total Teams participated from all schools and colleges were 15. All teams were well prepared and had a great spirit of Nationalism. The good thing about this event was the no. of girls participated were more than the no. of boys. This means the girls are nowhere behind the boys. All students were well disciplined and full of enthusiasm. The student of Govt. 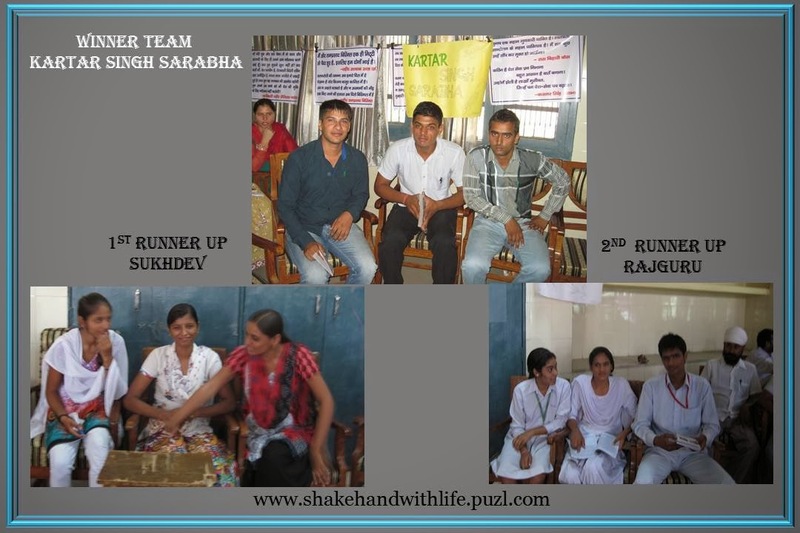 College Bahadurgarh were also cooperated in the event. The Quiz lasted about 3 hrs. The Quiz was started by qualifying round. After the qualifying round only six teams remained for rest of the four rounds. 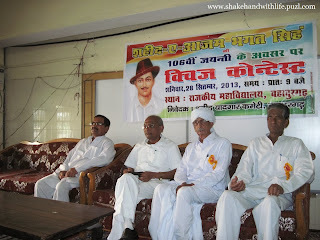 The team were named as "Bhagat Singh" , "Sukhdev" , "Rajguru" , "Chander Shaker Azad", "B.K. Dutt" and "Kartar Singh Sarabha"
The Quiz was closed with a speech of a girl child Neeti in remembrance of Bhagat Singh. She got great round of applause of all participants and members of Shaheed Yadgar Committee. The words of her really sensitize the nerves of everyone. The certificates of participation of each individual participant were delivered before writing this report on all participated schools and colleges mail id. This is not the time to rest, in fact this is the time when we have to work hard to introduce the history of all real Martyrs to upcoming generation to build up their character and to make cultural change in the society so that they all feel proud being an Indian.